Stressing over dinner is a waste of time; you should be enjoying time with your family instead. Consider preparing dinner in the slow cooker before you leave for work, that way you can come home and serve your family a delicious dinner without worrying about what to make when you get there. Get started with the three scrumptious dinner recipes below. These recipes are simple to prepare and made with easy to find ingredients. Hamburger Stew 2 potatoes, cubed 3 carrots, sliced 1 onion, sliced 1 cup celery, sliced 1-cup peas, frozen 1-cup corn, frozen 1/2 cup green beans, frozen 1 small can cream of mushroom soup 1 small can water 1 large can diced tomatoes 1 pound ground beef, browned 2 teaspoons Cajun seasoning Salt & pepper, to taste Place the potatoes, carrots, onion, celery, peas, corn and green beans in to the slow cooker and mix the vegetables together. Add the hamburger to the vegetables and then pour the diced tomatoes over the top. Mix the cream of mushroom soup, water, Cajun seasoning, salt and pepper together in a separate dish. Pour the liquid over the top of the ingredients in the slow cooker. 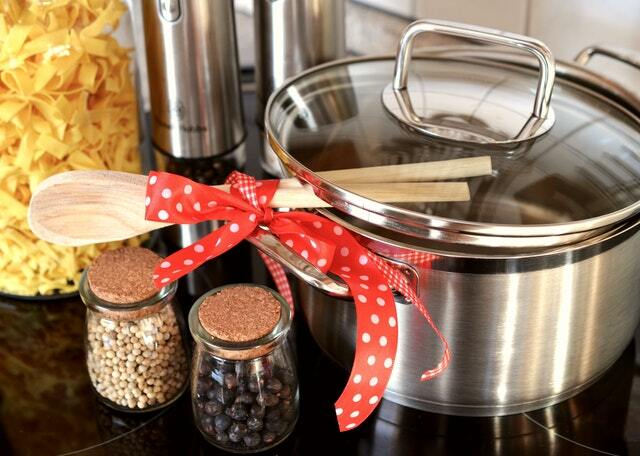 Cover the slow cooker with a lid and cook on low for 6 to 8 hours. Sweet & Sour Pork Chops 4 boneless pork chops, browned 2 apples, quartered 3 tablespoons brown sugar 3 tablespoons maple syrup 1 16-ounce bag sauerkraut Pour the juice from the sauerkraut in to a separate dish. Place 1 cup of the sauerkraut in to the bottom of the slow cooker and then arrange the pork chops on top. Place the apples on the pork chops and then top with the remaining sauerkraut. Mix the brown sugar, maple syrup and sauerkraut juice and then drizzle the mixture over the ingredients in the slow cooker. Cook on low for 6 to 8 hours. Chicken & Rice Stir-Fry 1-cup white rice 1 cup celery, sliced 1 cup carrots, sliced 2 pounds chicken breast, browned and cubed 1 can cream of chicken soup 1 bottle stir-fry sauce Sprinkle the rice around the bottom of the slow cooker in an even layer. Place the chicken over the rice and then add the vegetables. Mix the cream of chicken soup and stir fry sauce in a separate bowl to combine and then pour over the ingredients in the slow cooker. Cover with a lid and cook for 4 to 6 hours on low.